Coming into tonight’s game the Devils have been 5-2 since coming off the Olympic break and find themselves just 2 points out of a Wild Card spot in the Eastern Conference. New Jersey comes into Florida for a quick 2 game road trip that could have them sitting in a playoff spot once this weekend is through. With a hot offense and a hot Adam Henrique the Devils came in looking to keep rolling toward a playoff spot. The first period started off with the Devils keeping pace with the young Panthers. The Devils soon found themselves behind the Panthers when Patrik Elias turned the puck over in his own zone that resulted in a Panthers 1-0 lead. The goal was credited to Brian Campbell, his 7th of the season from Huberdeau and Hayes. With that goal the momentum swung heavily in Florida’s favor, until 18:45 of the period when the Devils took advantage of the man advantage. Jagr was credited with the PPG his 21st goal of the year from Brunner and Zajac. The second period started out much different from the first. The Devils came out with much more energy and took the lead 2-1 at 2:02 of the second. Salvador scores his first goal of the season on a blast from the point that went in off a Panther defender. The assists went to Elias and Clowe. The game seemed to be evenly played until 13:13 of the period when Elias scored his 15th of the year from Brunner and Greene. Shortly after Elias’ goal the Panthers answered back with a shot that rang off the crossbar. The Panthers kept the pressure on when Quinton Howden scored his 2nd goal of the season at 14:30 to close the gap to 3-2, from the former Devil Scott Gomez and Huberdeau. Florida started the third period with the power play. The Devils successfully killed off Jagr’s hooking minor that carried over from the prior period. 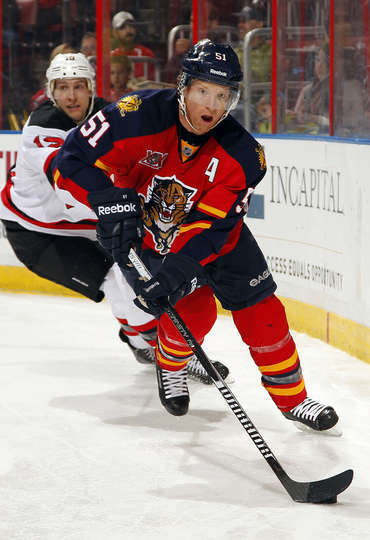 After much back and forth play the Panthers tied the game on a turnover from Mark Fayne in the Devils defensive zone. Brad Boyes scores his 18th goal of the year at 4:24 of the third, unassisted. The Panthers continued their offensive pressure and took the lead at 10:00 of the third period. Scott Upshall was credited with the goal his 13th of the season, from Brad Boyes. The Panthers would put the exclamation point on the game when Vincent Trocheck scored the empty net goal to give the Panthers a 5-3 lead. The Devils face the Lighting tomorrow night, and thankfully on a short turnaround. They need to take this loss and take their frustration out on a Lighting team that sits in front of them in the wild card standings. With games winding down the Devils need to find a way to string more than 2 wins in a row. With little help on the scoreboard the loss stings just a little more.